In sports betting there is an obvious preference of the public to bet on favorites when it comes to sides but also the overs when it comes to totals. This generally forces books to adjust and inflate these lines to compensate for all of the public money that ends up pouring in on these sides/totals. Other aspects influence on this unmeasured passion for big teams, they also fall in love with certain teams and strong performances rather quickly, especially if it’s done on national television. But they often leave aside potential opportunities of higher return betting, as certain matches don’t receive nearly as much attention as largely publicized ones. Today’s one of those opportunities when Watford faces Burnley. Perhaps Walter Mazzarri may have been bouncing this week after Watford defeated Manchester United last weekend a 3-1 and a sumptuous comeback against Westham United. The hornet has struggled in their first 3 league, but the truth is that it seems to have gotten the winning formula as they produced 2 consecutive league win. Walter Mazzarri led side sits 9th on the log with 7 points in 5 games. But nothing is guaranteed because today Burnley will present an entirely different challenge. It will be intriguing to see how the sides approach the match. After the surprising victory that came with the thrashing of Liverpool 2-0 on day 2 Burnley hasn’t seen any more victories. The claret has gone 4 games without a win and will be in search of their first win over Watford in 7 competitive game. Dyche led side sits 16th on the log with 4 points from 5 games. Burnley was soundly beaten by Leicester last weekend and sits just a point above the relegation zone. Burnley has won 1 of the first 5 league games this season. In addition, the Claret is winless in their last 4 competitive games. Watford is currently on 2 games winning streak. Likewise, the Hornet has won 2 of their first 5 league game so far this season. 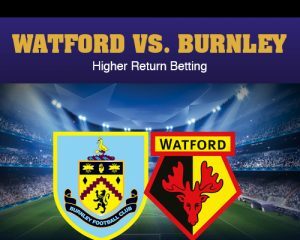 Watford recent run of form is something many bookmakers will bank on as they throw their weight behind a hornet win. However, Burnley is a side in need of quick redemption , which makes the tie evenly poised. With this background it seems that a draw is the most likely result, followed by Watford walking away with a win. Burnley’s only injury is Ashley Barnes (hamstring) with Sean Dyche’s line-up settled and just a couple of selection dilemmas. Dyche needs to omit one of Dean Marney, Steven Defour or Jeff Hendrick, while Jon Flanagan could come under consideration for a start. Mazzarri will be without Daryl Janmaat (shoulder), while Younes Kaboul and Stefano Okaka are also doubts.